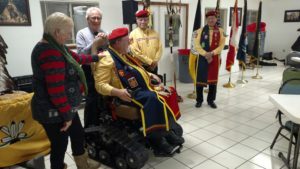 On the evening of December 16th, Defender Mobility, a small charitable arm of the Police Officers Association of Michigan, had the honor of attending The Anishnabe Ogitchedaw Veterans and Warrior Society of the Saginaw Chippewa Indian Tribe. Why were we at this prestigious gathering? 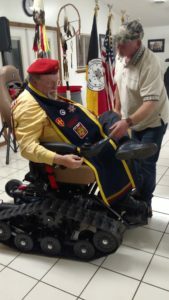 Because Defender Mobility, through the generous donation of the David Hough Foundation, was going to present a Trac Fab Mobility chair to the society’s Sergeant at Arms, Chuck Knowles! Mr. Hough had presented the donation as part of his sponsorship of a successful fund raiser for our nation’s military boxing programs in October at the Detroit Athletic Club. Chuck and his wife, Carol, attended the meeting. Carol told us that Chuck is unable to stand for more than 5-6 minutes and that the five heart attacks he has suffered make it very difficult for him to walk more than a few feet. She announced they had recently celebrated their 50th wedding anniversary and that his disability had prevented him, for some time now, from any kind of hunting. This had led to depression and despair. Chuck is a victim of Agent Orange poisoning following his service to our country during the Vietnam War. While Carol knew the surprise was coming, Chuck had no idea. He thought we were there to demonstrate the chair and said that he had ridden in one in a parade some time ago and dreamed of getting a ride in one again. He was certain he would never take one into the field. After the ruse, I told Chuck the chair was HIS!!! Both he and Carol broke into tears. She said she had never seen him speechless before! Members of the Saginaw Chippewa Tribal police, Mt. 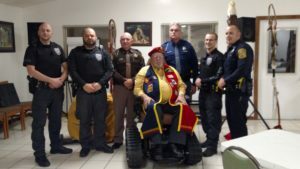 Pleasant PD, the state police and the Isabella County Sheriff’s department had come to pay their respects to this veteran (and to share some of the feast!). Ed Humpert from Bad River Outdoors in St. Charles is the Michigan distributor for the Trac Fab chairs and was on scene to give Chuck a quick overview of the “off road chair”. I felt blessed to attend this special ceremony and honored to represent David Hough and so many POAM members and private donors who have helped Defender Mobility deliver 15 of these chairs in just over 36 months. Thanks for allowing me to represent you.